THE SKINNY: This anti-aging sample pack included three products to use together: Extra Creamy Cleansing Foam, WrinkleResist 24 Balancing Softener Enriched and WrinkleResist 24 Day Emulsion SPF 15. Now I love Shiseido's facial moisturizers and sunscreens. But I'm not so keen on this anti-aging line. Not that there's anything wrong with it. It's just that if I'm going to pay this much for skin care, I want it to feel fabulous and blow me away. This, sadly, didn't. The line has ingredients to counteract hormonal changes to your skin, according to the website. The Extra Creamy Cleansing Foam actually is soft and creamy. It felt good and very gentle on my face, more like a moisturizer than a cleanser. It rinsed off clean but did leave behind some mascara on my eyes. WrinkleResist 24 Balancing Softener Enriched is like a toner without the alcohol. You apply with a soft cloth after washing. Again, it felt cool and creamy and there's nothing harsh about it. This product is supposed to rehydrate skin, but it really didn't leave my face feeling that soft. 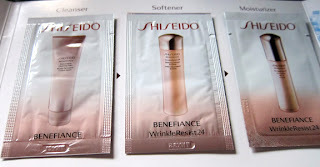 WrinkleResist 24 Day Emulsion SPF 15 is my favorite of the three, probably because I am such a fan of Shiseido's moisturizers. This is a thin liquid that glides on and really does work to soften and protect. KEEP OR TOSS: Keep the moisturizer, toss everything else. CHECK IT OUT: Find this line at the Shiseido website. It's also sold at Sephora.